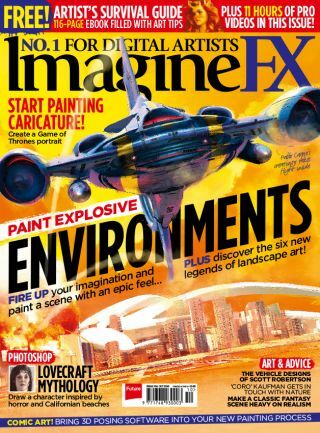 Meet the new legends of environment art and get their hard-earned tips in the new ImagineFX. Be unique, learn the basics, maintain the spirit of your sketch… these are just some of the bits of advice shared by pro landscape artists, as we celebrate the modern masters of creating epic, moody landscapes. Meanwhile, cover artist Pablo Carpio shows how to make the most of 3D and 2D tools to paint an explosive landscape. There’s more! Joann Lori uses ArtRage to paint a Game of Thrones caricature, Dongjun Lu paints a detailed dragon rider and Tom Foster reveals how he uses 3D tools to create his 2D comic art. Our traditional art section features Wylie Beckert on her art from her recently Kickstarted Wicked Kingdom Deck, while Justin ‘Coro’ Kaufman wonderfully captures the essence of a tree. The Q&A section is packed with advice from pro artists, including how to depict body language, glass distortion, stone columns, polished metal, realistic smoke and more. We look at Virtual Reality and the Google Tilt Brush and ask whether it’s about to revolutionise digital art. Creature artist Brynn Metheney lives and works from her cosy apartment full of natural wonders, plant life and, er, dead things. Entrepreneurial concept artist and educator Scott Robertson talks about finding the artistic sweet spot between design and technology. Alix Branwyn explains her traditional and digital process for creating a dark and moody Lovecraftian illustration. As well as 11 hour of pro videos, numerous downloads of custom brushes WIPs and final art, you can also get hold of a FREE, 116-page Digital Artist’s Survival Guide ebook that’s packed full of bite-sized tips and key advice on using Photoshop, Painter, ArtRage, PaintTool SAI and SketchBook Pro. Subscribe today and save up to 47 per cent (based on a quarterly subscription), and get 20 per cent off the Adobe CC Photography plan (print and print + digital subscribers).